Infinite Art Tournament: Saint of the Month: St. Stephen! ...of Socrates and Stephen fame. Saint of the Month: St. Stephen! ...of Socrates and Stephen fame. for some reason holding a doll's house. Feast Day: Definitely September 17. Really Existed? Hard to tell. Place: Wales, England, or Turkey. The “Roman Martyrology” is the authoritative roster of saints, according to their saints' days, maintained by the Vatican. It is really just a list, with a very few details given for key figures in Christian history. Obviously it’s an important point of reference for the amateur hagiographer, but unfortunately I haven’t been able to get access to a current version that doesn’t require a paid subscription. In the Martyrology as it was about 100 years ago, at any rate, was a reference to two saints “…in England, the holy martyrs Socrates and Stephen,” whose saints’ days were September 17. Of this pair, St. Stephen is our Saint of the Month. Now, when Mrs.5000 suggested I start a Saint of the Month feature, it wasn’t my intention to focus on minor saints. Indeed, I picked St. Stephen for today to stay out of that rut – the St. Stephen that you usually hear about, after all, is a very important guy, the “protomartyr” or first saint, a figure right out of the Acts of the Apostles. What I hadn’t counted on is that Stephen is a very common name. If I’d thought about it, I would have remembered that when “Good King Wenceslaus looked out on the Feast of Stephen” it was Christmastime (or to be more precise December 26 or 27, depending on whom you ask). There are lots of St. Stephens, as it turns out. 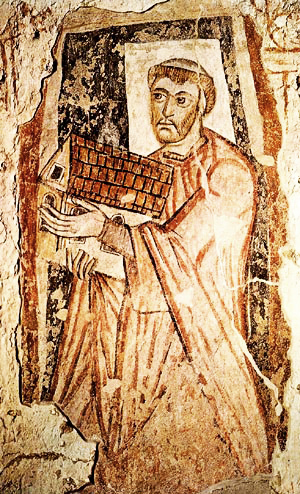 There are, among others, St. Stephen of Muret, St. Stephen of Mar Saba, St. Stephen of Obazine, St. Stephen of Surosh, St. Stephen the Anchorite, St. Stephen the Great, St. Stephen Harding, St. Stephen I, St. Stephen Theodore Cuenot, St. Stephen Vinh, St. Stephen Min Kuk-ka, and last month’s Saint of the Month, St. Stephen of Hungary. And out of all of these, perhaps none are as obscure as St. Stephen of St. Stephen and St. Socrates fame. The ubiquitous Rev. Alban Butler, a towering figure among 18th century hagiographers, wrote that their names are illustrious in the British Martyrologies. They suffered during the persecution of Dioclesian. Many churches in Wales were formerly dedicated to their memory; and they are thought to have glorified God by their death in that part of Britain. That’s a little vague except for the churches in Wales part, yet if there were churches in Wales dedicated to Stephen and Socrates there sure aren’t any now. Rev. Butler gave three footnotes, one to the Roman Martyrology (quoted in full above), one to a 16th Century source that does not in fact mention either Stephen or Socrates (I checked! ), and a third to a source that I have been unable to get my paws on. Based on the evidence at hand, though, “illustrious” would seem to be pushing the point. Online saint sites divide into two camps, depending on where they swiped their content from. One set says that St. Stephen was “an early martyr venerated in England" and that "No other information has survived.” The other set, cribbing from the Wiki, says that Stephen and Socrates "are recorded in certain martyrologies as having been martyred in Britain. It has been conjectured by some that what may have happened was that 'in Britannia' was mistakenly written for 'in Bithynia.'" Who’s doing the conjecturing? I don’t know. What’s Bithynia? Roughly, the northwest coast of Asian Turkey. So in sum, St. Stephen, always associated with St. Socrates, is an official saint by tradition, but no one is really sure why. The pair may have experienced religious martyrdom in Wales, or England, or maybe Turkey. If there is anything more known about these guys, it has eluded my amateur internet researches. I will try to go with somebody more famous again next month.